Montréal Police Kill Donald Ménard | C.O.B.P. As the first winter winds set in on Montréal, local activists gathered downtown at the corner of Ste-Elizabeth street and René Lévesque blvd. to protest the recent killing of Donald Ménard. In the early evening on Nov. 11, shocks from a police taser gun killed the 41-year-old Ménard, violence unleashed during an intervention at a rooming house in the city's Centre-Sud, near the corner of St. André and Ontario street. Ménard is the 88th person killed by police in Montréal since 1987 and the death affirms an urgent need for popular mobilizations against police killings. Accounts on the shocking incident sketch an early evening police intervention, sparked by an emergency call concerning a woman facing a possible drug overdose. As paramedics arrived on the scene, police also moved into the rooming house and quickly the situation turned deadly. Details on the violent escalation remain unclear in police statements and media reports. Why did a medical emergency call quickly turn into police killing? Media reports on Ménard’s death largely draw on the police version of events, as journalists fail to ask critical questions or investigate the deadly incident. Most reports point to four police officers on the scene at the time of Ménard’s death. How did the group of police fail to de-escalate the situation? 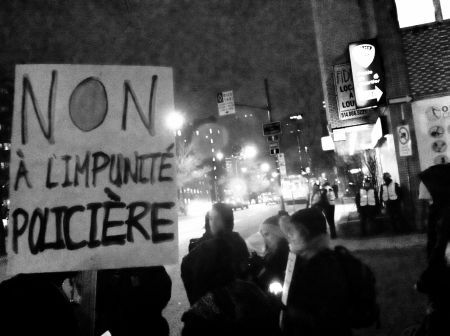 Why are journalists not investigating the killing of an unarmed man by police in Montréal? Previously Ménard had been staying at the Pinel Institute, a Montréal psychiatric hospital. Only days before dying under police taser shocks, Ménard disappeared from the hospital, seemingly to run away from the institution. Clearly Ménard struggled with poverty and mental health, an individual needing social support, not police baton strikes and a deadly taser gun. Did police really have to use a taser gun? In a city where police are consistently implicated in civilian deaths, why are journalists continuing to place their blind trust in police narratives? If journalism for many is about seeking the truth, or shaping an unbiased picture of events, why do Montréal reporters so often fail to ask the difficult questions, or truly investigate police killings? Clearly Ménard’s case speaks to the broader marginalization of the poor and homeless in the mainstream media. Populations often implicitly cast by reporters as disposable, or inherently criminal, in many ways people projected in the media as less valuable human beings. What role is the mainstream media playing in creating a political climate where police can kill civilians in Montréal with relative impunity? Shortly before the COBP action to protest the police killing, one family members called to say that Ménard was a loving father and that the killing was devastating. Important human details totally absent from mainstream media reports on the case, key details that illuminate the humanity of another person killed by Montréal police. Police killings of the homeless is a sustained reality across Montréal. “Surely people living in the rooming house where Ménard died, have heard about what happened to Mario Hamel, Farshad Mohammadi, Michel Morin and Jean-Pierre Lizotte, all homeless people who perished at the hands of Montréal police in the last 15 years,” continues COBP in the recent declaration. Difficult questions about police killings in Montréal certainly need to be urgently explored and police involved in the killings need to be held accountable. Journalists need to go beyond repeating police statements, commonly seen on CBC, and explore the root causes of poverty and homelessness that provide the socio-political context for violent police killings. Clearly growing economic inequality and increasingly less affordable housing in Montréal creates the context for marginalization of the poor, leading to political context that inherently justifies police violence as a final solution to social ills. Income inequality in Québec and Canada will only increase poverty and homelessness. Life on the streets, or in poverty, is a struggle to survive, and people are often cornered by laws or regulations that target their existence. As the social conditions that poverty brings about are criminalized, the homeless and poor will only face increasing state violence. Today in Montréal, a serious political investigation into Donald Ménard’s killing by police is critically important. However, we must also fundamentally question an increasingly unequal economic reality, that is clearly the context for Ménard’s death. Stefan Christoff is a Montréal-based writer, community activist and artist. Écouter une entrevue live du rassemblement à CKUT!